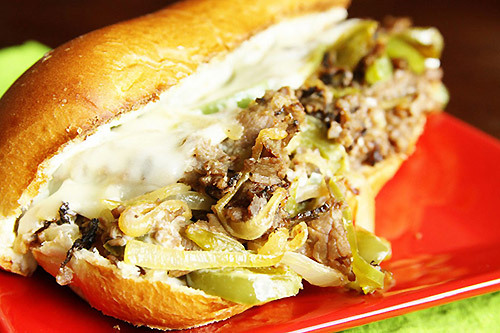 Testing out this recipe for Philly Cheesesteaks tonight, courtesy of Favorite Family Recipes. A report will follow. Bring beef broth and onion soup mix to a boil. Add roast beef, reduce heat, and simmer for about 5-10 minutes. In the meantime, in a large skillet saute onion and green pepper. When beef is done simmering, drain juices (you can keep the juice if you want to make an “au jus” dip. Add roast beef to skillet along with about 4 oz. of cream cheese. Spread remaining cream cheese on each hoagie roll. When the cream cheese in the skillet is all melted, generously portion beef mixture onto each hoagie roll. Top with provolone cheese and place sandwiches, open-faced on a large baking sheet. Broil on high for about a minute or until cheese becomes bubbly and bread becomes slightly toasty. Remove from oven and serve immediately.